"The CX3 / F3 is as realistic a ball flight as I have ever seen!" I decided to start with little brook manor as you suggested. I know it well since it is one of the R-Motion courses. -I get consistently good traces on full swings as well as putting. like to play bump and runs and the ball would carry the proper distance but instead of running they would backspin. I turned down chipping within 17yards down to 3000 from 5000. I checked the cameras and both traces picked up properly. 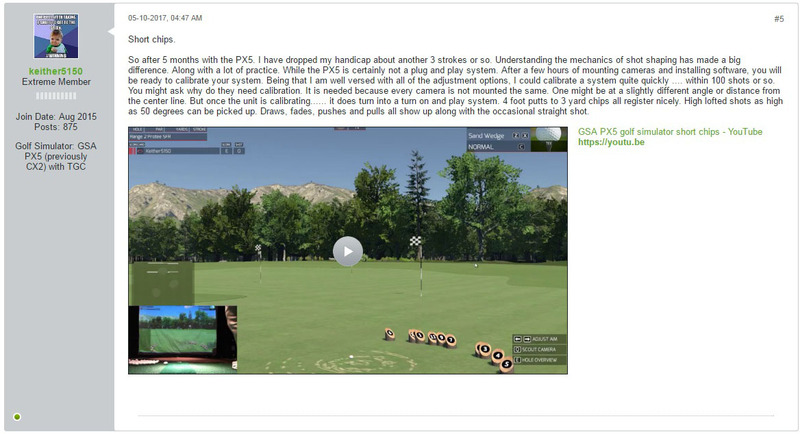 (I should have taken screen shots) -I believe I corrected my wedge issue with the clubhead getting into the FOV. I am positioning the ball just in front of the rear line sensor which moved me back just enough. I am a little concerned how this may effect club face and direction if it may move the ball left or right. I figured out a way to get a proper LA with my set up. I shifted the image up so that I can move my launch position back. I also added a 12x12 fiberbuilt fairway piece ahead of my hitting area. I chip from there and find that the ball flight and carry is pretty accurate on slow chips. Because I moved the launch position back, full shots are within ½ degree of the raw angle shots. So, good news!!!!! You don’t have to add anything to the control panel. Flop shots have to be taken from further back as the club head sometimes comes into play. I think that I have everything working as well as my X,Y system. Short chips are working well now. 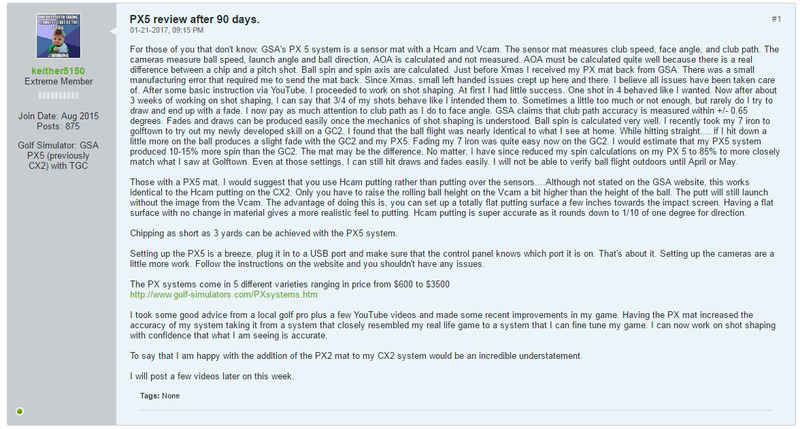 The above video is from customer Keith showing putting using the new Converging stereo setup. Martin, Yesterday I was having trouble with IBS when it switched to putting. The screen filled with white specs. Today I tried it with the putting camera gain turned all the way down to zero. Problem solved. I suppose that this is the case due to the difference in shutter speed. I did a computer reboot and found that I didn’t have any no reads during the 13 holes that I played today. Maybe suggest that a reboot might be helpful after a CP update. IBS was turned on and it works great. I will be switching out to a full putting green shortly and I am hoping that I won’t have any issues. I have tested the LS cam with pieces of my stance mat from FB. I can adjusted it the it works fine. Chipping and putting was working great. Off the tee, I thought that the ball flight was too straight…. Maybe too forgiving. So I set up for a big draw. I managed to get 27 degrees of right SA……so my system can pick up mishits for sure. Then I set up for a fade but with less SS. The ball started right about 2 degrees and had left SA of 9.7 degrees. So the ball started right and faded back to the left nicely. I am really happy with the new stereo set up. It seems like Kevin is dialing in his settings as well. And the best part…. There is nothing for you to fix at this time. I have had the good fortune to be in a long-standing business relationship with Golf Simulators of America. I have put their simulators into an entertainment venue that my company has had a large part in outfitting. Prior to committing to work with GSA, I did considerable research into a number of golf simulator companies and created a “short-list” for consideration. In the end, my decision to run with GSA was influenced by a few factors which I am happy to share. The first, as is often the case in a project with a fixed budget, was cost. A continual frustration I experienced as I engaged in discussions with a number of golf simulator companies was the unwillingness of these companies to be upfront and honest in quoting the full cost for the purchase and installation of a golf simulator. For example, I would receive a detailed quote for a couple of golf simulators. However, it was not until much later in the process that I was made aware of extra charges, such as substantial maintenance fees, software licensing fees, installation fees, and even the need to purchase specific golf balls from the golf simulator manufacturer. I should point out that my company was not opposed to paying a premium for quality, but it was frustrating to not receive a straight-up answer regarding the full cost in order to purchase and install a simulator. In contrast, I found my dealings with GSA to be much more straightforward. The price I was quoted was the price of a simulator. I had the freedom to change the system depending on my needs or what software I decided to run, and the price would change accordingly, but it was a straight-forward and clear process – I was never hit with last-minute cost changes. Secondly, and very important for my company, was the fact that Golf Simulators of America’s owner are involved in its daily operations. My company did its due diligence and it was a lengthy process in deciding which company to go with. When I called Golf Simulators of America I always knew who would be answering the phone. They were always very prompt in responding to my inquiries. Some of the other companies had dealers/reps change multiple times over a six to eight month process. Additionally, and it may seem like a small thing, but I appreciated the fact that I was able to build a relationship with the owners of GSA. My company is exceptionally proud of the manner in which it conducts its day to day affairs, and I believe that the relationship I have been able to cultivate with GSA is an example of how rewarding it can be – from both an economic and human-centered perspective – when things go right. I just wanted to send you a note of appreciation for all you two are trying to do to help me. In the days of do the least it takes to get by, you folks have gone above & beyond the call of duty! Laz has worked his tail off trying to make everything perfect, not just good, but perfect. The quality of his work in going the extra mile is so impressive. I just couldn’t ask for more. I just wanted you to know just how appreciative I am of the effort put forth. You guys are the best & if you need a reference please feel free to have them speak with me. As I mentioned to you on the phone, I have one of your swing sensor mats which is a fantastic product! Accurate and fairly simple to use, it allows me to continue to play golf through the winter months here in Colorado. Before I purchased the mat, I researched every product available and one of the key aspect that made me settle on your was its modular nature. Beyond the cost of full simulators, for me a major consideration was the room they take up - I simply don't have that much space to permanently devote to one. With your system, I am able to set it up in less than 5 minutes, play for as long as I want, then easily take it down. I have my projector and halogen light permanently mounted to the ceiling, along with hospital ceiling track for the projection screen. I have a plywood mounted stance mat with a cut out to accept the swing mat. In order to use the system, I lay the stance mat down on the floor, slide in the swing mat, pull out the projection screen, connect the computer and I'm playing! All in less than five minutes. Putting it away is just as easy, and then I have my room back! Great system! Just thought I would drop a few lines to tell you how much I am enjoying my GSA simulator my wife purchased for me last year as a Christmas gift.For entertainment purposes, it is the hit of my neighborhood as we have golf night, at my house every week and I have guys standing in line to get into the foursome. Now for the best part, I have dropped my handicap 8 strokes and am starting to have more confidence all the time when I go to play at the "real courses". I started with just the sensor mat and hope to expand to ball tracking in the future. The graphics are wonderful and it feels like you're "at the real course". The feedback you get from the simulator has definately helped me to improve my swing greatly. 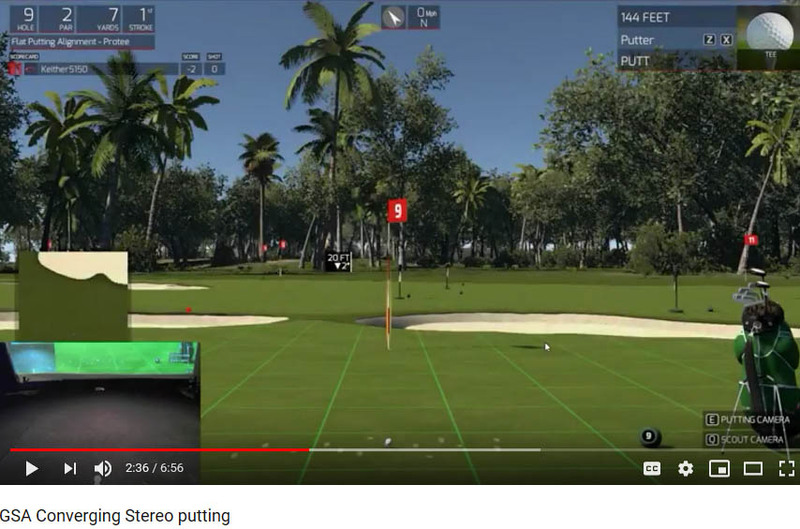 Thank You for all your hard work in developing this simulator, and I know that you are R&D ing new products to enhance the simulator as we speak so "Bravo" to Golf Simulators of America for developing an affordable, expandable golf simulator, with GREAT support, that I know that my friends, family, and I will enjoy for years to come. Hi, received and installed the GSA today. It's fantastic. Playing on Carnoustie right now. I live just 6 miles from there and have played the course a few times.The graphics are so accurate." ".. these GSA courses are breath taking!" I've always loved GSA Golf, but the latest update pushes it to the next level for usability and features. I can honestly say I'm 100% happy with this software  it works beautifully! Plus, some of the new courses released this year are spectacular renditions and have contributed greatly to an already outstanding course library. I am very impressed. can’t tell you how much I’m enjoying playing golf this winter with a foot of snow outside. I built my entire simulator by hand, converting what was once my front living room into a state of the art golf room. That sensor mat and software have been sensational. Working with the swing analysis has lowered my handicap from a 15 to a 12. Am shooting for single digits by spring. It has been a great adventure, a challenge to build, but the reward of now playing almost every day is spectacular. I’m the envy of the neighborhood. Amazing fun (going to finish my round at Turnberry tonight, can't wait to finish work haha). Also very surprising how poor my swing is looking at the photographic evidence, extremely beneficial tool and the whole setup has friends and family ooohhhing and aahhhing!